E. Myers - I Am Alive / Dreamland. Vinyl 12. Bleep. A few 12"s in and E. Myers still sure knows how to get a party going. Anyone who’s witnessed tunes like ‘Rabona’ and ‘Love’ work their magic in a club over the past couple of years can testify to the power of E. Myers’ music. On this latest drop Myers once again demonstrates their knack for breathing new life into classic Midwest house styles. 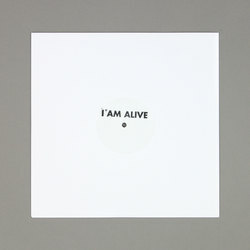 With its euphoric bassline and undulating synths, ‘I Am Alive’ might be the most exuberant and full-blooded thing Myers has created to date. Flipside ‘Dreamland’ is more cautious, embellishing a dinky synth sequence with sparse 808s and flushes of keyboard over the course of nine minutes.